Designed by President and Chief Instructor of Tactical Defense Institute, John Benner the Ka-Bar TDI Folder incorporates the same low-profile, fast-and-efficient deployment principles as the TDI fixed blade but now delivers them in a modern frame lock flipper for every day carry. Comes with a black G10 front scale, black oxide coated stainless steel frame lock and matching AUS-8A blade. Brand new, direct from Kabar Knives. Blade: The robust spear point blade is saber ground for a good balance of durability and cutting performance with a nearly full length top swedge to enhance piercing performance. The blade rides on nylon washers and deploys with speed and smooth reliability for decisive operation via the index flipper or dual thumb studs. A non-reflective black oxide coating delivers discreet use. 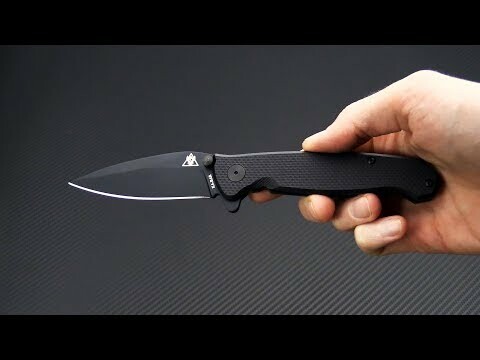 Handle: The slim handle of the 2490 is made from liner-less Black G10 on the front for texture and weight reduction while the frame lock side is solid stainless for high level strength and smooth operation. A G10 backspacer gives some protection in the closed position while maintaining the low-profile look of the knife. Carries via a spoon-style, black coated, stainless steel pocket clip reversible for right-hand only carry. AUS-8A Steel is a low carbon, high chromium stainless steel produced by Aichi Steel Corporation, Japan. We've found it to have an excellent balance between toughness and strength. It offers good corrosion resistance and is capable of acquiring a razor sharp edge. It typically dulls faster than S30V, but has better edge retention than 440C. Sharpening should be a breeze. The "A" signifies that AUS-8 steel has been annealed after the steel has been cold rolled to relieve stress prior to heat treatment.